The best thing you can do for cats is to understand exactly what causes their stress. That way, when unexpected bumps in the road (literally and figuratively) pop up during your move, you’ll be armed with the knowledge to make the right decisions. Stress has two root causes for cats: they simply aren’t fans of change, and they’re also territorial critters. That means that a sudden jolt out of their normal routine or a rash introduction to a place that doesn’t feel like their domain can stress them out and lead to some not-so-fun events like accidents in the house or even escape attempts. The core piece of advice for moving with cats is this: do everything you can to keep moving days predictable and routine and make their surroundings as familiar as possible. While there are certain things to do consistently throughout the entirety of your move (like making sure you barricade off all possible escape routes), there are specific preparations and precautions you can take during each distinct phase. Some cats don’t need a carrier and will contently sit in your lap, purring away. But because most cats are skilled escape artists in general and become even more motivated to say sayonara when they’re stressed, using a carrier is something most cat owners will have to do during a move. Start getting your cat accustomed to a carrier before the big day, especially if it’s new or your cat hasn’t spent much time in one yet. Leave the carrier on the ground with the door open for him or her to explore, coming and going at will. Try putting a few treats inside and walking away—the key is to let cats explore on their own, giving them the feeling of control over the space. You can even feed your cat in the carrier to trick him or her into spending time there. Start by placing the dish at the entrance of the carrier and moving it a bit farther back every day until your cat has to go all the way inside to eat. Starting your cat on a routine will go a long way in increasing predictability when you’re on the road. If you’ve already got a routine for your cat, put in a little extra effort to really stick to it. If you have a particularly anxious cat on your hands, make an appointment with your vet to talk through options and discuss anxiety medication or sedation options before you move. Bring moving boxes into the home a week or two before you start to pack. While the clutter can be annoying, it’s important to let your cat get familiar with their presence. Make sure your cat’s identification tags are up to date and get a collar if he or she doesn’t already have one, just in case. If you’re moving far enough away that you’ll need a new vet, get all of your cat’s veterinary records before you go—they will be necessary when you arrive and handy if you have to make a vet stop along the way. Speaking of identification, it’s a great idea to make sure your cat is microchipped and that the information associated with the chip has your updated information—that’s usually the first thing the shelters and vets check for when a pet is lost. If you plan on moving your cat by plane, there’s a fair amount of prep that goes into it, so start the process early. First, you’ll likely want to consult with your vet to make sure that your cat is healthy enough to fly. Airline travel can be especially strenuous and hazardous for cats, so you want to be sure that your cat will be okay before you make all of the arrangements. Once your cat is cleared to fly, the next thing you’ll want to consider is finding an appropriate carrier for the trip that meets your airline’s specific regulations and requirement. The type of carrier you use will depend on whether your cat is coming with you in the cabin or is going in the cargo hold. Keep in mind that there are certain times of the year when, and destinations where, airlines won’t accept pets as cargo because of extreme heat or cold conditions—you’ll want to clear this away beforehand and monitor the weather leading up to your flight since the last thing you want is a surprise rejection of your cat on travel day. Because flying with your pet is its own can of worms, the Humane Society has put out this lengthier guide to help cat owners navigate the process—it’s a lifesaver. When moving day arrives, you have a few options for keeping your cat calm. You can keep your cat in one room with lots of nooks and crannies (like an extra moving box or two) where he or she can hide out during the shuffle. If you don’t have a room that’s a good fit or you’re worried that the door might accidentally get opened anyway, you can always keep your cat in the carrier or have a friend your cat likes come over to hang with kitty while the move is underway. When it comes to hitting the road, feed your cat a slightly smaller breakfast than normal to reduce an upset tummy in the car. If your carrier has a litter pan, make sure it’s full of fresh litter and consider covering the carrier with blankets. The dark can be soothing to cats—just be sure to account for weather conditions if it’s a warm day. If your carrier doesn’t have a litter pan, make sure to add in some time every two to three hours to let your cat out to relieve itself. Also, make sure and food and water are properly secured—kibble flying all over the place certainly won’t help your cat stay calm. Even though your cat might cry, try your best to resist the urge to open the crate and soothe him or her—remember that scared cats are likely to bolt, even just into a small space in the car that you’ll have trouble getting them out of. Pro tip: keep a bit of packing tape with you in the car in case the carrier ends up needing ad-hoc repairs. Cat proofing your new home is the key to a successful transition for your furry friend. 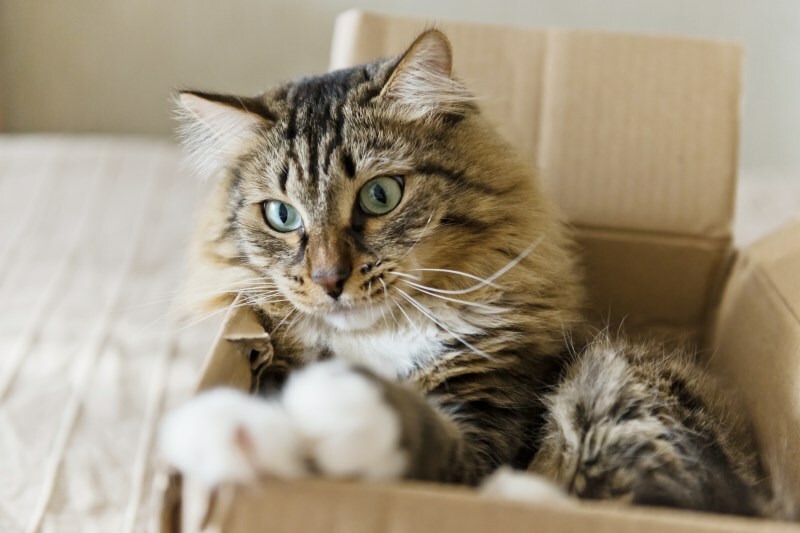 Have a look through your new place and plug any holes or nooks where a cat could get stuck—if they’re stressed during the transition, they’re likely to try to burrow away. If you can, double check that the place is free of chemicals treatments like pesticides and insecticides that can be harmful to cats. Once it’s time to bring your cat inside for the first time, find the quietest room in the house and fill it with your cat’s food and water dishes, litter box, bed, and toys or other soothing, familiar items. Make sure your cat’s food and water are in different areas of the room from the litter box—cats often won’t eat or drink if these items are too close together. Keeping cats in this sanctuary room for a few days will give them time to get used to the sights, sounds, and smells of her new abode without overwhelming them with access to the whole place. Once your cat is ready, place a second litter box where you plan to have one permanently and open the door to your cat start to explore gradually, but keep everything the way it is in the sanctuary room so there’s a familiar space to go back to for at least the first few weeks. Keeping outdoor cats inside for the first few days is a good way to get them used to the new space and to reaffirm that this is going to be their new water and food source, which is what keeps outdoor cats coming back. You can even hide treats around the house that they’ll have to hunt for if you’re worried about them getting bored indoors. However, if you’ve ever wanted to transition your outdoor cat to an indoor cat, moving is an ideal time to do so. Moving with cats isn’t the easiest thing in the world, but it’s been done time and time before, which means there are a lot of great resources out there. Think Like a Cat is geared towards raising kittens, but it’s chock full of behavior tips that can work for cats of any age. The Humane Society offers information on everything from picking out a collar to traveling with your pet in case you want to make your move into an adventure. If you read up, follow these tips, and plan accordingly, you won’t go wrong! Your cat will be purring away in a new home in no time.